Paleogene bird remains from Africa are scarce. A substantial but rather taxon-poor avifauna was reported from the late Paleocene and early Eocene phosphatic beds of the Ouled Abdoun Basin in Morocco, whose fossiliferous deposits originated in an epicontinental sea (Bourdon 2005, 2006; Bourdon et al. 2005). All avian species described so far represent marine taxa, and remains of the Pelagornithidae and Prophaethontidae predominate. A few bird fossils were also found in the middle Eocene of Nigeria (Andrews 1916) and Togo (Bourdon 2006), but the only other Paleogene African avifauna of significance comes from the late Eocene-early Oligocene deposits of the Jebel Qatrani Formation of the Fayum in Egypt (Rasmussen et al. 1987, 2001). This formation is of fluvial origin and stretches over the Eocene-Oligocene boundary. Although the age of the lower sequences has been debated, it is now considered to be late Eocene (Rasmussen et al. 2001). 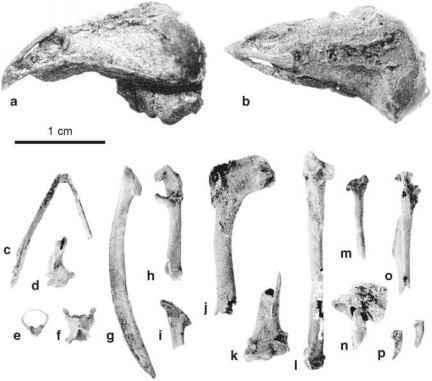 The avian specimens from the Jebel Qatrani Formation consist of isolated and often fragmentary bones.